In nearly 3,000 protests nationwide, students from the elementary to college level are taking up the call in a variety of ways. Some planned roadside rallies to honor shooting victims and protest violence. Others were to hold demonstrations in school gyms or on football fields. 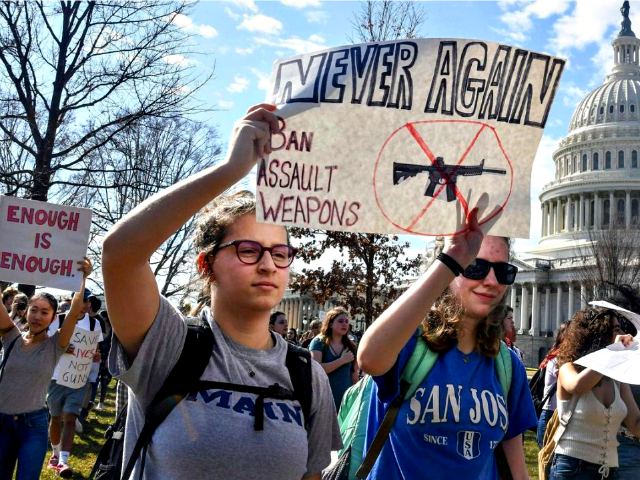 In Massachusetts and Georgia and Ohio, students said they’ll head to the statehouse to lobby for new gun regulations. The coordinated walkouts were loosely organized by Empower, the youth wing of the Women’s March, which brought thousands to Washington, D.C., last year. The group urged students to leave class at 10 a.m. local time for 17 minutes — one minute for each victim in the Florida shooting — and suggested demands for lawmakers, including an assault weapons ban and mandatory background checks for all gun sales. “Our elected officials must do more than tweet thoughts and prayers in response to this violence,” the group said on its website. Districts in Sayreville, New Jersey, and Maryland’s Harford County drew criticism this week when they said students could face punishment for leaving class. In Pensacola, Florida, Superintendent Malcolm Thomas ordered up an in-school assembly instead. He warned students that they could discuss voting and mental health issues, but not guns, and saying that political banners would not be allowed. “You can’t make political statements, it can’t be a pro-gun or anti-gun assembly,” Thomas told the Pensacola News-Journal. Free speech advocates geared up for battles. This nationwide action is one of several protests planned for coming weeks. The March for Our Lives rally for school safety is expected to draw hundreds of thousands to the nation’s capital on March 24, its organizers said. And another round of school walkouts is planned for April 20, the 19th anniversary of the Columbine High School shooting in Colorado. After the walkout Wednesday, some students in Massachusetts say they plan to rally outside the Springfield headquarters of Smith & Wesson, where students and religious leaders are expected to call on the gun maker to help reduce gun violence. At Case Elementary School in Akron, Ohio, a group of fifth-graders organized a walkout with the help of teachers after seeing parallels in a video they watched about youth marches for civil rights in 1963. Case instructors said 150 or more students will line a sidewalk along a nearby road, carrying posters with the names of Parkland victims. The walkouts have drawn support from companies including media conglomerate Viacom, which said it will pause programming on MTV, BET and all its other networks for 17 minutes during the walkouts, and allow students to temporarily take over MTV’s social media accounts. In suburban Atlanta, one of Georgia’s largest school systems announced that students who participate might face unspecified consequences. Other schools sought a middle ground, offering “teach-ins” or group discussions on gun violence and working to keep things safe. Officials at Boston Public Schools said they arranged a day of observance Wednesday with a variety of activities “to provide healthy and safe opportunities for students to express their views, feelings and concerns.” Students who don’t want to participate could bring a note from a parent to opt out.